A Killona mobile home and two vehicles parked nearby were destroyed by fire at about 11 p.m. Tuesday (Jan. 2). 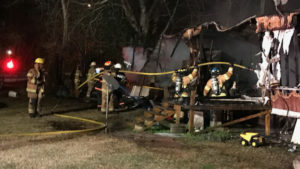 Killona Volunteer Fire Chief Trevell Gordon said the mobile home was reported on fire in the 500 block of Adam Street. The residence was unoccupied at the time of the fire, Gordon said. However, he said the owner did advise she had left two space heaters and the oven on to heat the home when she had left earlier that evening. Two adults with five children resided in the mobile home. While en route, Gordon said they were further advised the residence was fully engulfed in flames and two vehicles parked near to it also were on fire. Killona VFD arrived on scene at 11:03 p.m., deploying hoses to extinguish the fire. It was soon joined by Hahnville and Luling volunteer fire departments on the scene, bringing to 25 the number of firefighters at the scene. 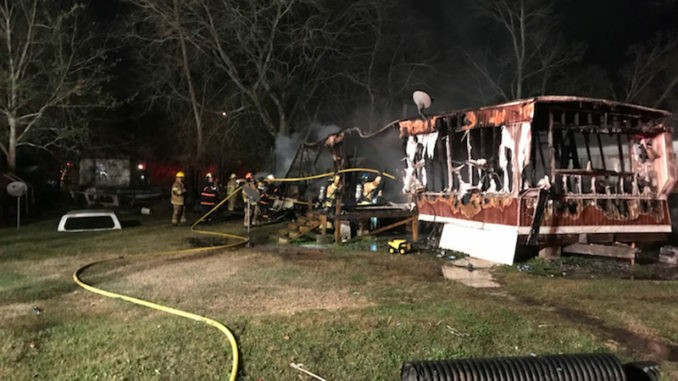 Gordon said the fire was extinguished at 11:44 p.m. with the mobile home and two vehicles destroyed, as well as a neighboring mobile home with minor exterior damage. The cause of the fire is listed as undetermined, he said.